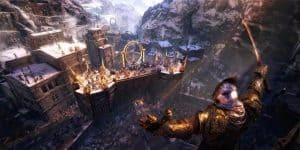 Shadow of War Release Date Pushed Back to October 2017 | Nerd Much? Monolith Productions has announced that Middle-earth: Shadow of War will be delayed from its original release date in August to October 10, 2017. The developer has reasoned that they want to deliver the “highest quality experience” and require more time to provide this. Shadow of War opens up the world of the pervious game in many ways, including are a larger world, the story, and of course the famous Nemesis System. As seen thus far in various gameplay videos and trailers, the main characters Talion and Celebrimbor are more badass than ever with special abilities courtesy of said resident elf. All in addition to the many pathways available to the player when taking down a given enemy stronghold. The similarities to Assassin’s Creed are many and varied, but it seems with Shadow of War, the game finally takes the story and gameplay to a whole new level. Building upon and creating new content everyone can enjoy, even those who are not fans of the first game. Once agan, Shadow of War will be delayed until October 10, 2017 for the PS4, Xbox One, and PC. The game will also appear at E3 in the coming week, so we do have a little something to look forward to during our long wait.